On April 24, 2012 Chris was offered a part –time position as a dishwasher at the new Wegmans Columbia grocery store. Wegmans, one of the top ten employers to work for in the United States, also prides itself on providing employment opportunities for individuals with disabilities. The Wegmans philosophy is to treat each of their employees as family members and in return fosters a positive working environment for its employees. The Wegmans management team has worked with Chris to provide him with a set work schedule and the management team has gone out the way to accommodate what he needs to adapt to his new work environment. Chris’s biggest challenge has been trying to convert his short term memories into long term everyday work habits. While the transition hasn’t been easy for Chris to learn at first, the Wegmans staff has provided Chris with the training and resources needed to succeed. Chris’s goal is to eventually work full-time for Wegmans. 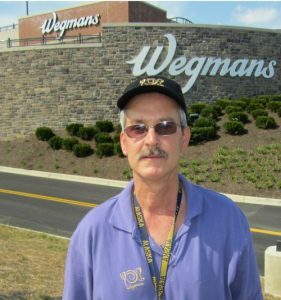 He is thankful for the support that the Wegmans team has provided to him and is very happy working for them.